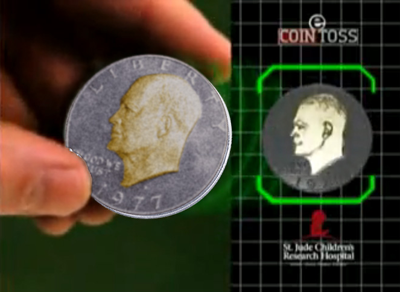 At a stadium, fans have never been able to experience the coin toss, never able to see commemorative coins that honor charities and heroes, nor see special coins created for the big game. It might as well be 100 miles away. What if you could be on the field with the referee, with team captains, and see the coin and experience the coin toss? That would be something! eCoinToss™ Sports Display delivers much of that on-field experience to all the fans in the stadium. The fans can see details on the coin, the faces of our heroes. Its like the coin is in your own hand. Not only that, with eCoinToss™ Sports Display all the fans will see the real movements of the coin in the referee's hand, as he presents heads and tails to the team captains. When the coin is about to be tossed, will your team win? eCoinToss™ Sports Display shows the coin flipping in the air. When it lands you see it at the same time as the captains -- as if you were on the field. Look for eCoinToss™ Sports Display and be at the center of the action!